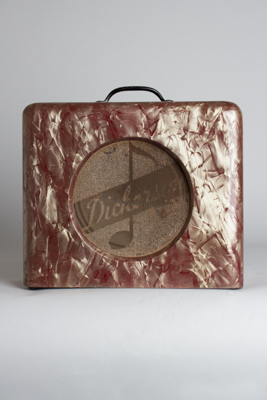 Dickerson Tube Amplifier (1946), made in California, grey Pearloid finish. Height is 11 in. (27.9 cm. ), 12 1/2 in. (31.8 cm.) width, and 5 in. (12.7 cm.) deep. This typical 1940s student amp is a little worn but nicely original, including the field coil speaker (dated on the frame to 1946) and tubes. Has had a bit of cap work and a new 3-prong cord added, as well as some slight cracking to the Pearloid exterior, but it remains mostly intact. A sweet-sounding little amp with a cool vibe. Very Good + Condition.